So many people ask “just where is Malta?” and you just might be asking yourself the same thing. Well, get ready to jump in feet first into a country that is spectacularly beautiful and historically fascinating. Malta awaits the adventurous sailor who is willing to make the journey thousands of miles to the dead center of the Mediterranean Sea. The archipelago of Malta lies only a few hundred miles off the coasts of Tunisia and Libya and just 68 nautical miles south of Sicily. Fly through Italy and then get a jumper flight to the capital city of Valletta. Once there jump in a cab that is driven by a friendly but crazy and fearless taxi driver (not kidding – Malta has the highest rate of automobile accidents in the world) and head to your destination – hopefully a beautiful charter yacht. Breathe a sigh of relief once there and then take some time to recover from jet lag and travel fatigue with a fresh, cool glass of local Malta wine – probably a nice Sauvignon Blanc. Malta is an intriguing mixture of Arabic culture and language with a mix of Christianity, Italian culture and European architecture. Trying to grasp what this all means is impossible until one travels there and even after that it’s still hard to soak in. Malta has a long and very colorful history dating back to the dawn of civilization. 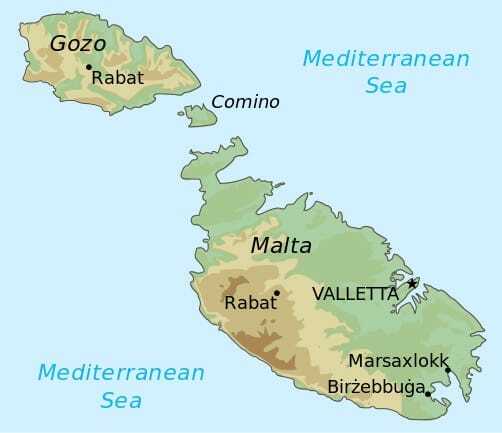 The Maltese islands went through the Neolithic period followed later on by the Phoenicians, the Carthaginians, the Romans and the Byzantines. All of these cultures and languages have left their indelible mark on Malta. In 60 AD St. Paul was shipwrecked on Malta while traveling to Rome and ultimately brought Christianity there. Arabs conquered the three islands (Malta, Como and Gozo) in 870 AD and left their important mark on the Maltese language. 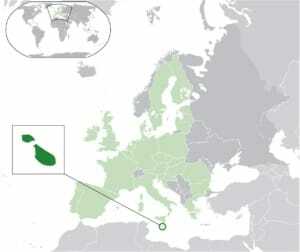 Until 1530 Malta was an extension of Sicily. It was Charles V who bequeathed Malta to the Sovereign Military Order of St. John of Jerusalem. Their rule lasted several hundred years until 1798 when Napoleon Bonaparte arrived and conquered it for France. In 1798, Napoleon Bonaparte took over Malta on his way to Egypt. The French presence however was short-lived as the Maltese requested British help to remove them from France’s thumb. British eventually did oust the French and their rule lasted until 1964. Malta has just celebrated its 50th year of independence and is now part of the European Union. Got all that? It’s definitely overwhelming sometimes and can be mind boggling. But the best part is that once you arrive you will want to dive into the history and soak up the Malta Mediterranean sun, food, wine and culture for yourself. 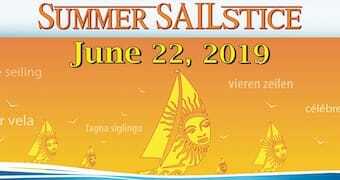 For the sailor wanting to charter in Malta it’s a search through a private company or a private owner (usually British or Italian) because Sunsail and Moorings do not exist in Malta. One that is a good suggestion would be Marenauta Charters out of Valletta. They are a small Charter company that only manages about 15 yachts. 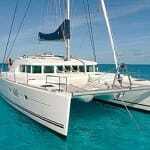 They are all in great condition and the marina services are superb. The Royal Malta Yacht Club in on the same quay and a really fun place to hang out, drink, meet other sailors from around the world. Also this is your stop for showering and for laundry and if you need to pick up Wifi. 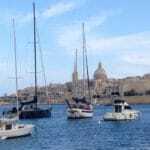 From Valletta the best place for the sailor to go first would be north to Comino – (remember Malta is SMALL) and is comprised of three islands – Malta proper being the biggest and then due north there is Comino (the barrier island) and Gozo the furthest north. Comino is a small almost uninhabited island due north of Malta proper. It’s a fairly barren island with some pine scrub and cactus but some amazing azure blue swimming holes. The only downside to Comino is during the day when the day tripper ferries and boats arrive and bring swarms of loud party going swimmers. Once they depart though on the last ferry around 5pm sailors have a beautiful landscape and anchorage (one of three) to themselves. It’s a great place to plan to cook on board. Watch the sunset, have a glass of cold crisp Maltese wine and watch the wind blow in. As a sailor its important to make sure that you have plenty of rode out and plenty of swing room – the outer lying edges of all the anchorages are full of underwater rocks, corral and reef. Don’t find yourself upon one of them by not planning properly in advance! 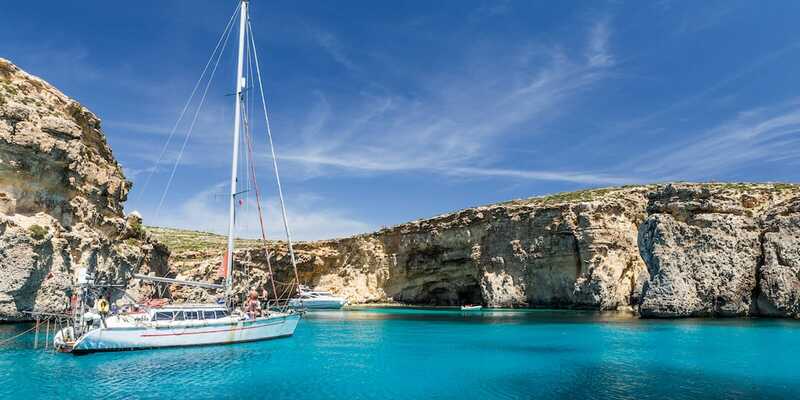 After a day or two chilling out on Comino it’s great to plan to head south again (Gozo is a tough sail with no safe anchorages so plan to go there by ferry – not on a sailboat) down the coast of Malta and head just north of Valletta to a small anchorage called St. Paul’s Bay that has beautiful views for the daytime. It’s a beautiful exploration by dinghy to the rocks and caves along the coast there. HOWEVER – beware – as sailors have learned the hard way the wind shifts there at night and huge wind and waves can roll in. It’s a great day anchorage but a terrifying and somewhat dangerous one for overnight. 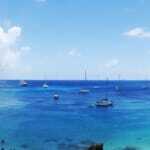 St Paul’s Bay was named after St. Paul, who was shipwrecked on an Island located in the bay. St Paul was shipwrecked on Malta during his journey from Caesarea to Rome and the Maltese people believe that it was St Paul himself who introduced Christianity to the local population. 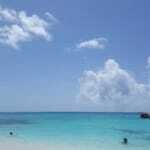 Some parts of Saint Paul’s Bay are very developed and have many touristic amenities. There are some very beautiful and stunning natural highlights in the area and the coastline here has wonderful open sea views. The coastline promenade provides a long and easy walk from St Paul’s Bay all the way to Qawra, with open sea views. Mistra Bay in the north part of the town is a pebble beach with numerous caves that were used as burial places in the past. At the edge of the cliff stands a military battery built by the knights, today used for aquaculture. St Paul’s Island is close by, and there are several dive sites, including the spot where St Paul was shipwrecked. For your overnight it’s a great idea to head back to Valletta (Marsamaxett Harbor) and just spend a night in your own marina/slip. Marenauta charters is open to having you come back anytime during your charter – which is wonderful – for re provisioning, relaxing or just regrouping before heading back out again. 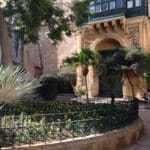 In Valletta one has so many choices for great restaurants. 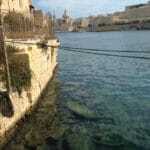 It’s a really fun twisty walk around the several marinas in Valletta harbor. Make sure you skip the commercial harbor (Grand Harbor) just south Valletta harbor – it’s dangerous, loud, busy and dirty. For a great view of the Marsamaxett harbor and out to sea head to the tip where Silema is – there are a lot of fun restaurants, nightclubs, and terrific food. It’s easy to find a mixture of Maltese traditional cuisine as well as Indian food, Lebanese food, Tunisian food and of course restaurants catering to the Italian tastes and the British who either live in or visit Malta frequently. Feeling adventurous? Jump back into a cab. Hold your breath and buckle up. It will be a hell of a ride but most likely you will meet a local who is willing to give you a very proud detailed history of his or her country. Once back on board it’s time to head back south to the tip of Malta – but get ready for some very detailed planning. Heading south means heading to one of the busiest ports in the Mediterranean. It’s a fascinating sail – be prepared. 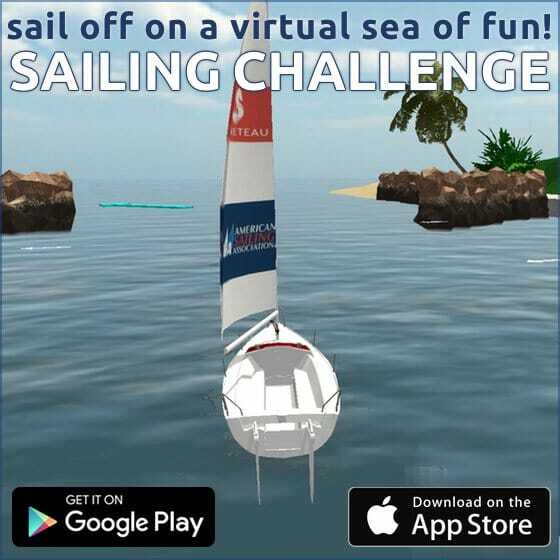 The sailor will encounter numerous fishing vessels dropping nets. Its highly advisable to head out to sea – at least 5nm off shore to avoid getting entrapped in these nets or encumbering the fishermen. The sailor will also encounter numerous tankers who are either travelling south to the north coast of Africa full with cargo or are returning full on their way back to Sicily, main coast Italy or further into the center of the Mediterranean. In addition there are large oil rigs off the coast of southern Malta. Why go there you ask? Because it’s exciting. It’s exciting to see all of this activity and imagine that you are literally in the center of it all. You are watching some of the biggest trade going on not only in the Mediterranean but for mainland Europe and for Turkey and Greece as well. It’s also a great way to practice some serious navigation. Navigating between reef, the southern tip of Malta, through oil rigs, around tankers and through the maze of buoys to the entrance is not only challenging but exciting. And remember – have a GPS but also a backup GPS and all your paper charts (most of British Admiralty in this part of the world) at hand and ready. Take fixes. Take depth checks frequently and always have someone on watch on the bow. Debris, nets (old and new) as well lobster pots are scattered liberally around this part of Malta. Once there, (breathing better now?) its time to familiarize yourself with the harbor. Its commercial and there are two main parts. Anchoring on the right side is tough – there are large tanker buoys everywhere and the depth drops off dramatically. So head straight instead and avoid going left where tankers refuel. Head to the far end of the marina in the middle straight ahead. Find a place to drop the hook far behind the tanker buoys and once set (it’s a good hold there with sand) take a breather, grab a glass of wine and watch the sunset. This anchorage is weird and wild mix of new and old. The town behind you is thousands of years old. The tanker in front of you is maybe ten years old and makes your small little sailboat seem inadequate and frail. No worries though. It’s a show to watch other boats come in and scramble for a place just like you. It’s a show so grab some wine and enjoy. 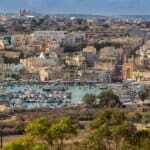 Once relaxed, head ashore for a meal at a small local Malta pub or restaurant. Watch your prop on your dinghy – again things in the water are scattered everywhere. It would be wise to talk about the prevailing wind direction in Malta but it’s virtually impossible. 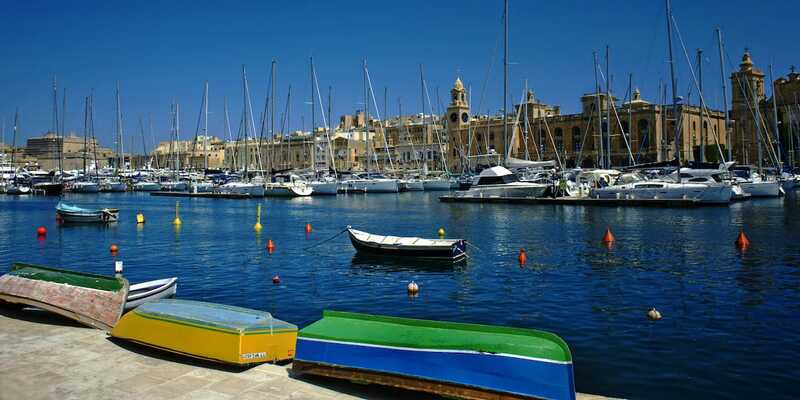 Winds in late August and September are typically supposed to come out of the Northwest – which would mean somewhat of a block or protection on the lee coast – since sailing is done on the east coast of Malta. However, it’s just not that easy. Winds can clock within an hour and have done so sometimes dramatically – even at 180 degrees. Be prepared for this and reef often and soon. Anticipate squalls that come in from the south and also big blows off the end of islands (especially coming around Comino). 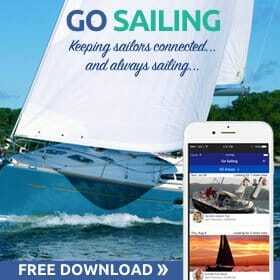 Check weather constantly and be prepared to do what it takes to enter and leave harbors safely. If a squall or wind shift is anticipated then by all means get to your anchorage or harbor sooner than you had planned. Failing to follow this course of action will result in some dangerous seas and possibly a very scared crew. It’s just not worth it. After leaving the south head back north again and plan to do some nice sailing off the coast of southern Malta weather permitting. Sailing some 5 to 10 nm off shore and one can get a lot of good wind and a good day sail. 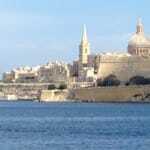 Its a lot of fun and usually a fairly easy sail back to Valletta harbor (Marsmaxett). 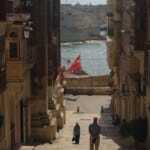 It’s advisable to plan to spend some time in old Valletta town. There are some wonderful restaurants, coffee shops and bakeries in which to spend some quality time. There are also some intriguing museums to visit and some fascinating walking tours to be had. Make time to stroll the old cobbled lanes and streets and soak in this amazing place. Just wander. Don’t plan. Just see where the winding streets lead you and enjoy. Remember you are in the center of the Mediterranean. Remember you are standing in a cross roads that has seen war, famine and the development of Christianity in this part of the world. Few people get to Malta. Fewer than 1% of Americans have ever been to or will ever go to Malta. So take a chance. Explore, venture out and remember why you travel. It’s the unknown. It’s the risk and it’s the excitement of finding what’s around the next corner! 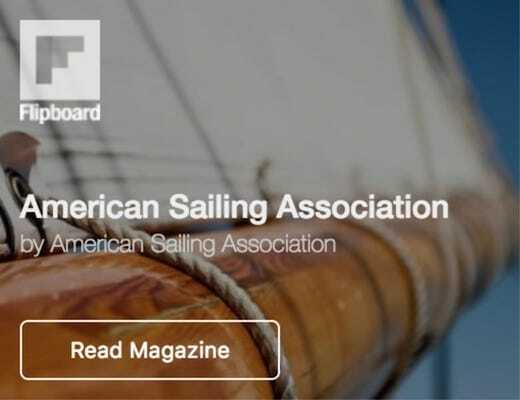 Article written by Stacey Brooks from SeaDog Sailing. Captain Stacey has a genuine love for teaching and is a long time American Sailing Association Instructor. I’m glad to see that the ASA is moving in to compete with the Malta Sailing Academy. Good luck Stacy. Small correction in your opening paragraph, the Mediterranean is not an ‘ocean’ it is a ‘sea’.